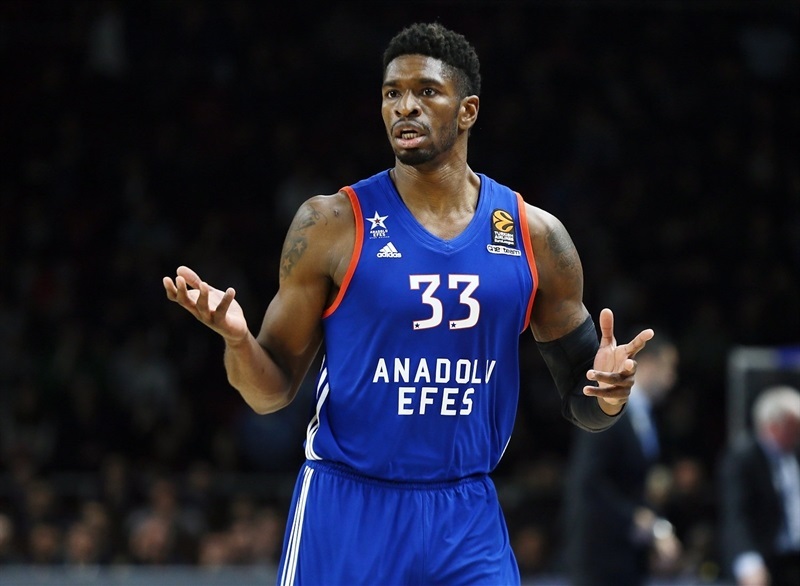 Anadolu Efes Istanbul secured a spot in the playoffs by holding off a late Fenerbahce Istanbul charge for an 80-77 victory on Thursday at Abdi Ipekci Arena. 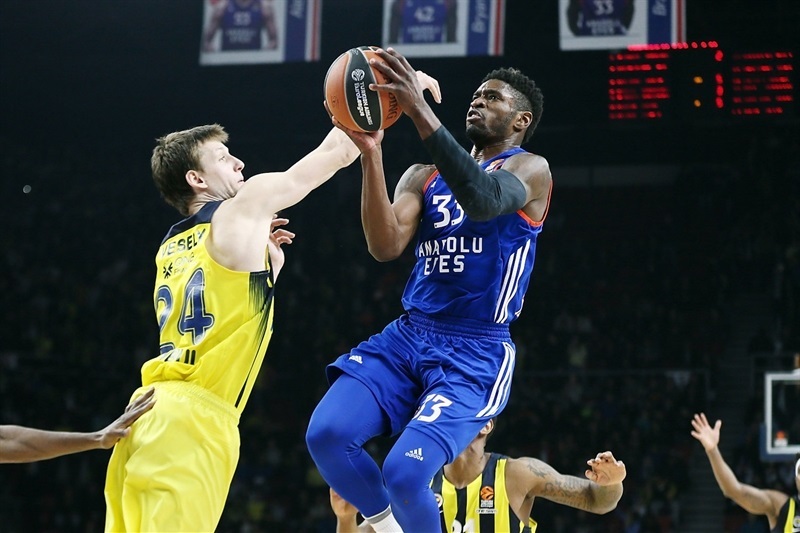 Efes led from start to finish for its third straight victory and the seventh in its last eight games. The victory took Efes’s record to 16-12, while Fenerbahce, which had already clinched a playoff berth, fell to 17-11. 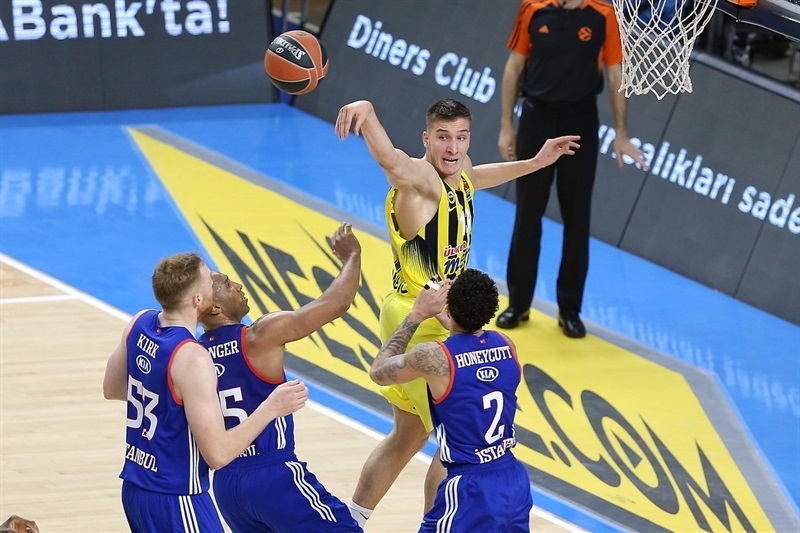 The hosts led by as many as 17 points before Bogdan Bogdanovic came off the bench to help Fenerbahce rally in the second half. 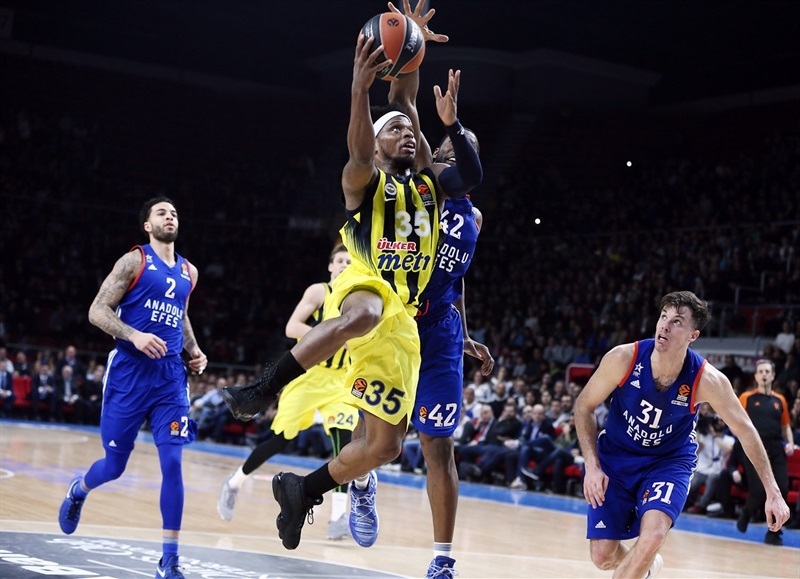 The deficit was shrunk to 2 in the final minute and Fenerbahce had a shot to tie it in the closing seconds, but Bobby Dixon missed. 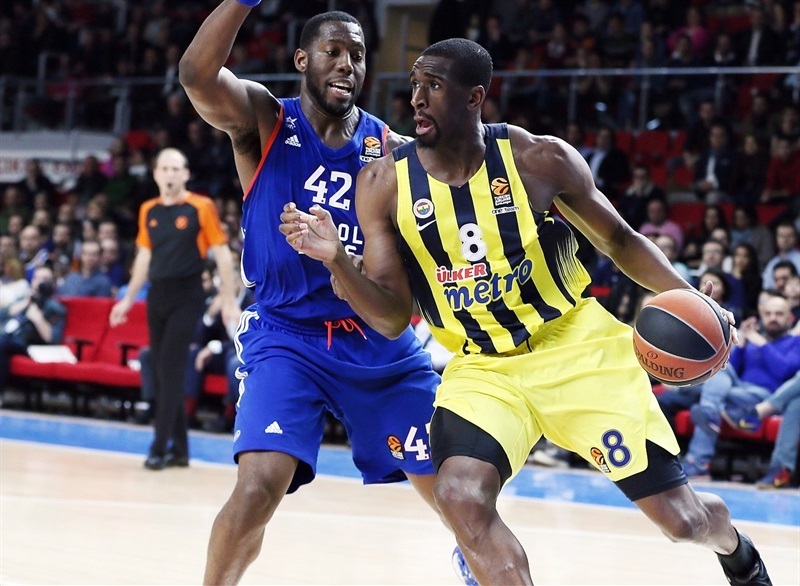 Bryant Dunston paced the Efes attack with 14 points, Jayson Granger tallied 13 points and 5 assists and Brandon Paul and Derrick Brown scored 10 points each. 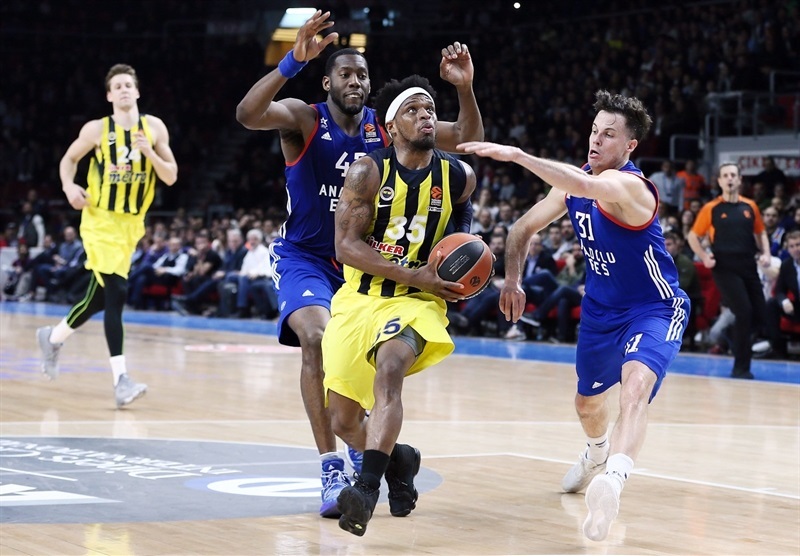 Bobby Dixon led Fenerbahce with 19 points and 8 rebounds, Bogdanovic scored 16 and dished 4 assists in 17 minutes, Nikola Kalinic added 12 points, Melih Mahmutoglu had 10 and Ekpe Udoh collected 10 rebounds in defeat. Cedi Osman got the hosts rolling with a three-pointer and a reverse layup. 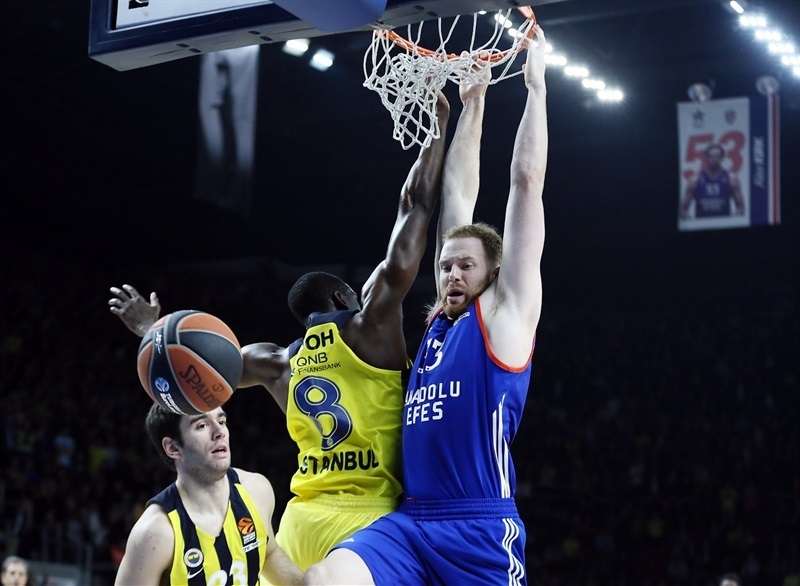 Jan Vesely applied his specialty, a thunderous slam, to get the visitors on the scoreboard, but a Derrick Brown triple gave Efes a 10-2 cushion. Fener fought back through its guards, but Dogus Balbay’s offensive rebound in traffic led to a Dunston layup as the hosts remained in control. Mahmutoglu hit a three and Vesely scored inside to make it a 1-point game. 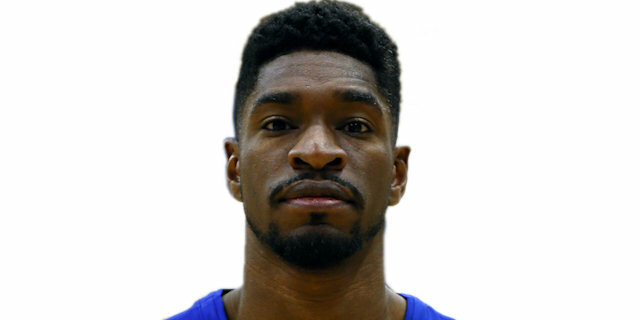 Balbay scored on Efes’s next two possessions and Thomas Heurtel came off the bench to find Dunston for a slam and hit a jumper that ended the first quarter with the hosts ahead 21-14. James Nunnally blew past Tyler Honeycutt for a slam as Fenerbahce looked to close the gap, but Alex Kirk scored inside and Heurtel took a steal in for a layup to establish a double-digit advantage, 26-16. The margin touched 12 on a DeShaun Thomas hook shot. A pair of Heurtel turnovers led to fast break points for Fenerbahce. Dixon’s three-point play narrowed the gap to 28-23, but Granger delivered 3 assists and Paul scored 5 points in a 9-2 push that put Efes back in control. Paul’s second triple took the difference to 40-27. Mahmutoglu and Dixon each hit from downtown to help the visitors get within 44-35 at the break. 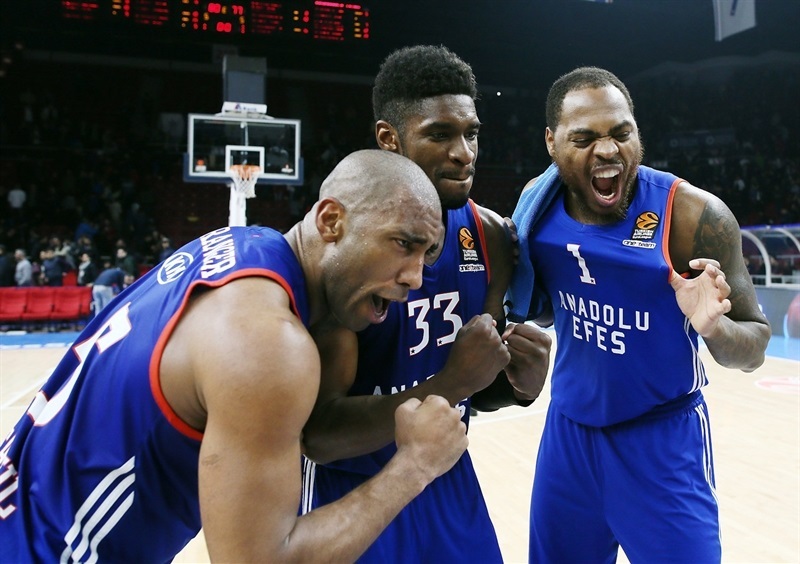 The teams traded shots to start the fourth quarter before Brown put Efes ahead 50-37. 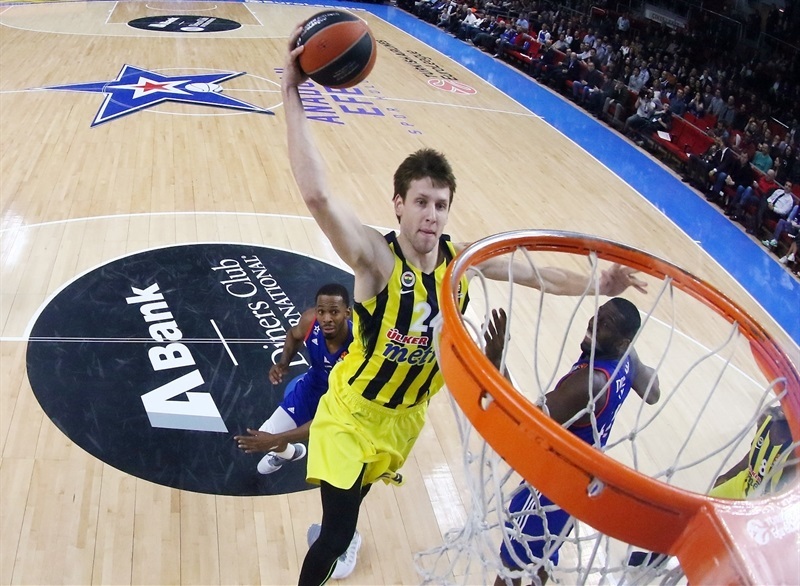 Fenerbahce called up injured guard Bogdanovic, who promptly delivered an assist to Udoh. However the Efes defense continued to frustrate Fenerbahce and Balbay’s three-point play made it 55-38. Bogdanovic knocked down a three and fed Udoh for the latter’s first basket, but Granger’s four-point play and later long jumper gave Efes a 63-46 cushion. Bogdanovic came up with 5 quick points and Nunnally added a three-pointer to make it 65-54 through three quarters. Bogdanovic drew a foul shooting a three and made the resulting free throws to give Fenerbahce hope at 67-59. 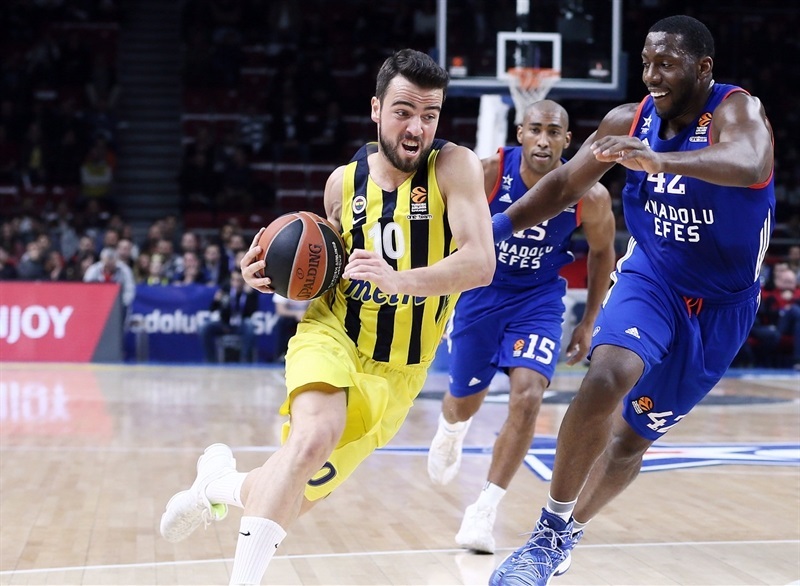 The visiting defense kept Efes scoreless for nearly four minutes, while Kalinic, Vesely and Udoh added free throws as Fenerbahce drew within 4. Nunnaly was whistled for an unsportsmanlike foul on Paul, who ended the Efes drought with free throws. 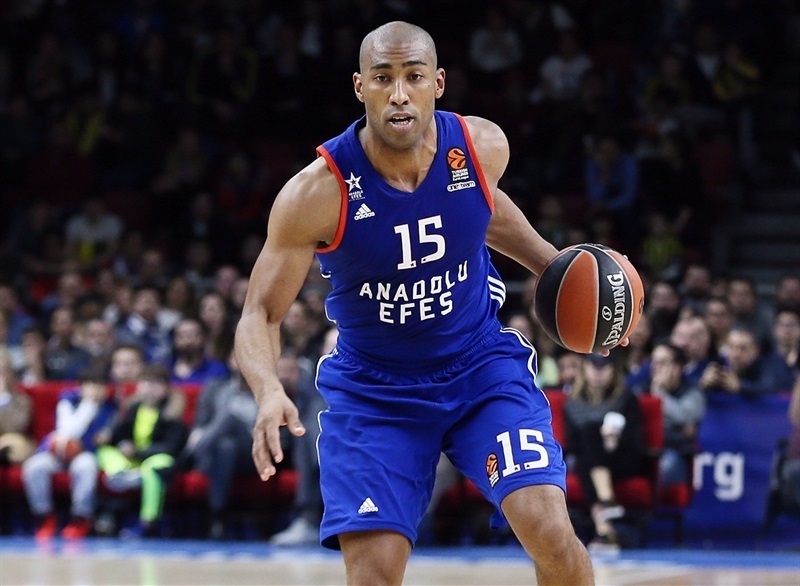 Granger penetrated for a layup that gave Efes a 71-63 lead midway through the fourth quarter. Bogdanovic went through the Efes defense twice more to get the visitors within 5. A key put-back by Dunston and a floater by Brown kept the hosts in control. However Udoh picked Granger’s pocket and Dixon buried a three-pointer to make it 78-76 with 37 seconds to play. Efes turned the ball over, but Bogdanovic missed a three-pointer that would have given his team the lead. Instead, Honeycutt drained free throws with 15.4 seconds remaining to make it a two-possession game. Fenerbahce got one final chance, but Dixon airballed a three-pointer in the final seconds that would have tied it. 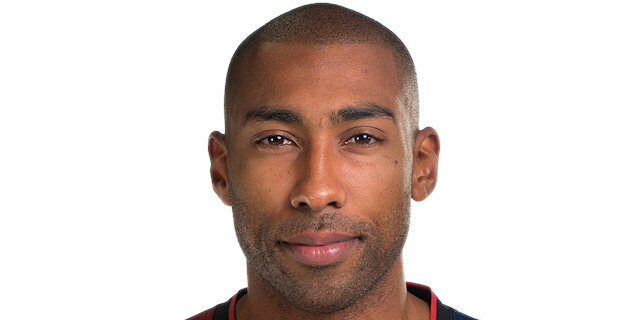 "First of all it is a great success for us to reach the playoffs. I think for every team it is tough to classify for the playoffs because when you see teams like Barcelona, Milan or Maccabi out, it is a great success. Congratulation to my players, because they deserved this. Today we played good for many moments in the game, but Fenerbahce is a great team and they know how to play finals. In this final today, we were scared to lose the game. We had a lead of 17 points and you see they can catch you; it’s not easy. But we had the concentration to take the game. When we started bad, we had a very bad schedule. We never had many games when we played very bad. It’s very complicated. " 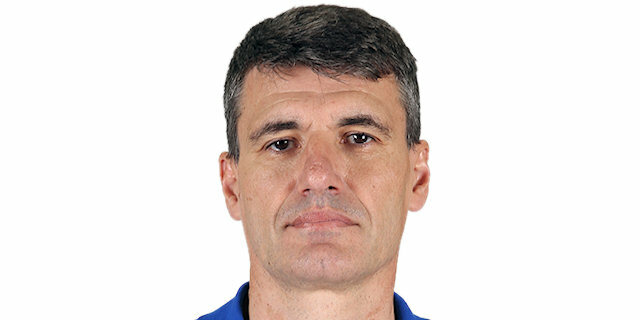 "First of all I want to congratulate Efes for an important victory. We tried all game to find the rhythm to come back in the game. Finally we found it, but in the last two offenses we played and handled it very badly. This is a very important part of the game; something similar happened against Maccabi. So we really must understand why. 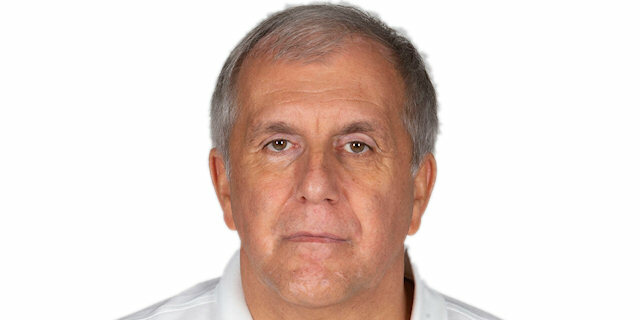 It’s obvious that our rotation is very, let’s say, short because of the situation we have with some players. And for me it was a big surprise because Bogdan really insisted to play even without almost any practice. " "The game was up and down. We kept our composure and we had a lot of guys step up for us tonight and make big-time plays. " "It’s an unbelievable feeling. To win a game like this against one of the top teams in Europe in front of our fans is a really good feeling. I’m not really happy personally because I almost tripped the game by myself in the end, but I have great teammates, great coach that always support us and most important is that we won. Our defense [saved us today]. Some key moments of the game we played solid defense. Of course we didn’t control the rebounds, but we gotta keep working, we have two more important games. "